– To have your rock ready at package pickup: Lost Soul logo rock with your name and distance, without a finishing time. Cost $55. Order deadline is August 1. If you are flying, indicate this to Ron so he can plan a smaller (flight friendly) rock. 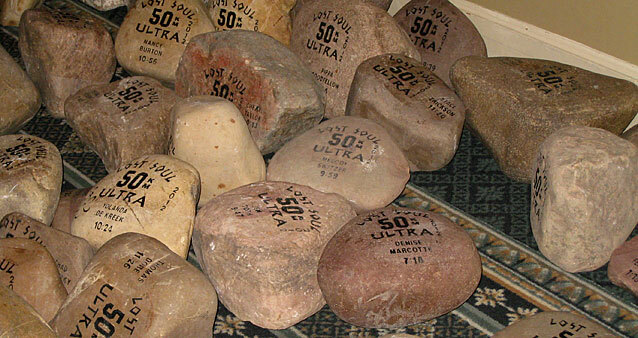 – If you can pickup your rock a few weeks after the race: Lost Soul logo rock with your name, distance, and finishing time. Cost $65. Rock can be ordered on race weekend. Ron will be announcing the race and will be at the breakfast. He will arrange for delivery to Calgary and Edmonton. If you earn a Top 3 category rock and want your name and time blasted into it, Ron can do that for $20 and it will be available a few weeks after the race.